Big Blue's Online Carburetor: STOLEN VANAGON CAMPER in San Francisco - T-Rex is missing! STOLEN VANAGON CAMPER in San Francisco - T-Rex is missing! ALERT IN SF! T-Rex is missing. CA License #2CRZ977. 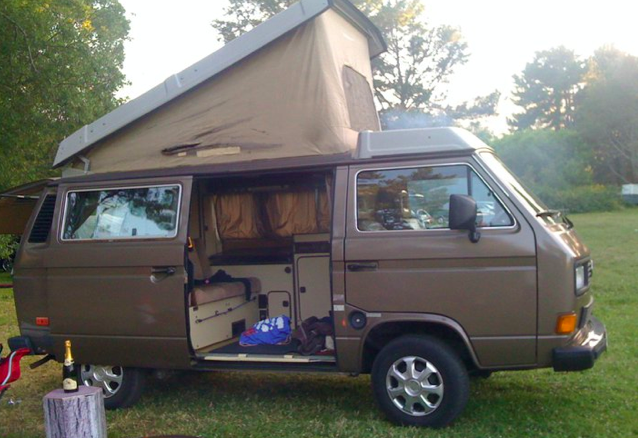 STOLEN:1986 VW VANAGON between 5:30am &630am. Fawn colored pop top. Last seen 474 pennsylvania. SF, CA. Please call the SFPD if you find 415-553-0123. You've seen this camper on the blog before. Now look for it on the streets. Thanks! UPDATE: As of Saturday evening, T-Rex has been found. Here's the official word from the owner: Hi! Yes, T-Rex was found! I went hunting for T-Rex after work and found her about 5 blocks away, curtains pulled and filled with junkie, hobo stuff. Looks like this person broke in, coasted down the hill and parked where ever T-Rex stopped. The bus was filled with stolen fitness gear, hobo supplies, and what ever else he swapped from his shopping cart. Unfortunately, the junkie had a cut hand and got blood all over the place. Yuck! T-Rex getting cleaned tomorrow. Thank you to everyone who posted and shared their concern for T-Rex. It is so nice to know that we have friends out there from coast to coast. If you ever see T-Rex out on the road be sure to wave!